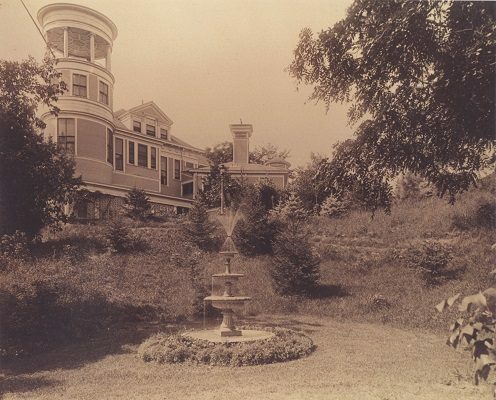 A visitor to Geneva Lake at the turn of the 20th century would have seen a vast wealth of impressive estates in a wide variety of architectural styles, from Victorian Queen Anne homes like the Black Point Estate to Classical Revival manses like the imposing red-brick home now known as the Driehaus estate. But a new trend in architecture was beginning to emerge at that time as well, one that would come to be known as the American Arts and Crafts Movement, which emphasized simplicity of form, the inclusion of local and natural materials and the incorporation of artisan, hand-made elements into architecture. 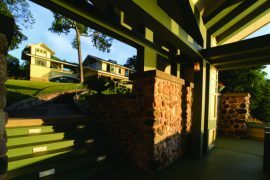 In the Midwest in particular, this architectural ethos evolved into a school of architecture known as the Prairie School. Because of this emphasis on the natural environment, one of the effects of the Prairie School’s influence on architecture was to elevate the role of the landscape designer in the overall estate design process. Landscape designers began to gain public notoriety; clients began to view them as artists. In the Lake Geneva area, these famous landscape designers included Olof Benson, the Olmsted Brothers firm and a Danish immigrant who had distinguished himself as Superintendent of Chicago’s Humboldt Park and would eventually design the grounds of twenty of Geneva Lake’s grand estates: Jens Jensen. Jensen was born in Dybbøl, Denmark (very close to the current German border) in 1860. His parents were successful farmers and Jensen grew up living close to the land on the family farm. “From the upstairs window where he grew up, he could see the Baltic Sea,” says Jensen scholar William Tishler. His lifelong fascination with the natural world was forged on this Danish farm with a view of the sea beyond. In 1864 when Jensen was just four years old, Prussia invaded his hometown and Denmark was forced to cede control. 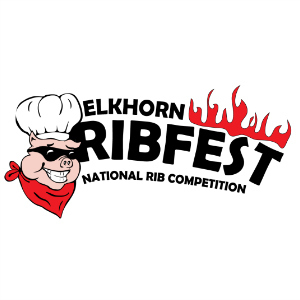 This event had a lasting impact on the area in general and on Jensen’s personal view of the world as he grew up there. It also had the effect of ensuring that Jensen became fluent as a child in both Danish and German, a skill that would serve him well when he eventually settled among Chicago’s German and Scandinavian neighborhoods on the west side of the city. One outcome of the Prussian invasion was to inspire the Danish people to promote their national traditions and heritage, and the Danish Folk School tradition was born. Danish Folk Schools are non-degree-granting institutions that embrace alternative educational methods to promote national heritage to adult students of the middle and lower classes. At the age of 19, Jensen attended the Vinding Folk School, completing the standard five-month course of study. Following his schooling, Jensen completed his mandatory service in the Prussian army. He spent most of his service with the Prussian Imperial Guard stationed in Berlin, where he spent his downtime sketching the city’s impressive Haussmann-designed gardens. Upon completing his military service, he returned briefly to the family farm, but soon set off on a new adventure: emigrating to America in order to start a career and marry a woman his parents disapproved of. After passing briefly through Florida and Iowa, Jensen settled in Chicago, where he took a job as a laborer with the Chicago West Park District. With his background and passion for the natural world, he gradually began to assume more responsibility in the Park District. In 1895, he was named Superintendent of Union Park and then a year later he was named Superintendent of Humboldt Park. 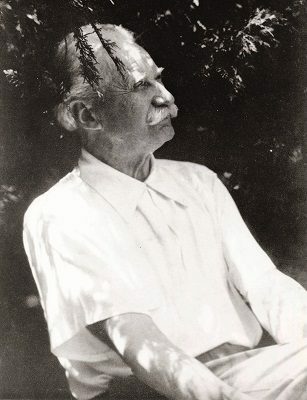 “When he got established in Chicago, he made some good friends with prominent Chicagoans, including Jane Addams, Carl Sandburg and Henry Chandler Cowles, a faculty member at the University of Chicago who is considered one of the fathers of the United States ecology movement,” explains Tishler. He also became fascinated with the native landscape of the Midwest. Together with Cowles and other prominent botanists, Jensen would travel beyond the city limits to study and collect the native plants and flowers of the area. However, in 1900, Jensen’s superior abilities and his powerful connections were not enough to salvage his job with the West Park District when he refused to participate in the political graft that was common in city government at the time. Despite his successes with the city parks, he left his job there to pursue private commission work. 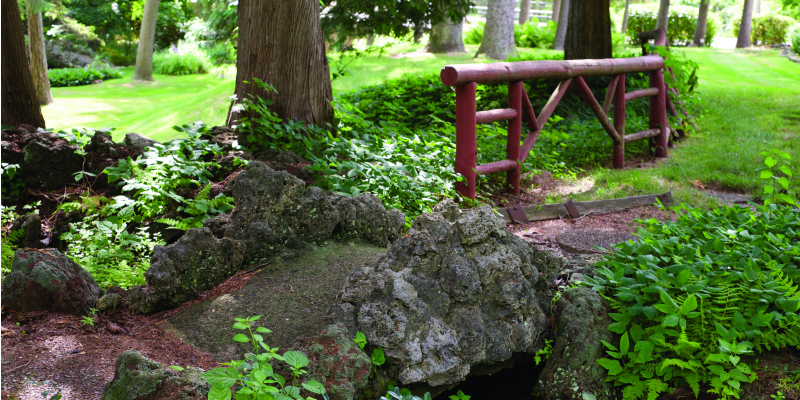 According to historian John Notz (whose great-grandfather Edward G. Uihlein was an early client who championed Jensen’s work), Jensen had already received a commission from Uihlein to design the grounds and gardens at his Lake Geneva estate. That estate, called Forest Glen, was located on the north shore of the lake between Williams Bay and Fontana. Notz believes this commission may have given Jensen the confidence he needed to leave his position with the city and start his own firm. So at the age of 40, Jensen turned his attention to private clients rather than public works, and opened a studio north of the city at Ravinia in Highland Park. Jensen’s connection with Uihlein, (who served as the Chicago West Park Commissioner) was fortuitous. According to Notz’s research, Uihlein not only provided the early commission that empowered Jensen to leave his job with the City of Chicago, but he also introduced him to many of the prominent Chicago notables and businessmen who would become Jensen’s clients over the next several decades. It required a great deal of work to regulate the brook and locate a great number of natural springs. Ponds were excavated and the sand so obtained utilized to fill low places. A dozen bridges had to be constructed; a drive road was built all around the place. It was an extremely ambitious project. In the first year, Uihlein recounts the many tasks that Jensen oversaw in the park: he leveled the ground, planted sod, seeded large areas, planted 100 fruit trees and countless shade trees and shrubs, laid almost 10,000 feet of tiles, prepared terraces for a vineyard, started a vegetable garden, constructed new fences, connected the water system with the old ground system, built a chicken yard, erected a windmill, repaired an existing barn, built a vegetable cellar, built an apiary and a duck house around a new pond, poured cement walks and built an observation tower with several connecting paths through the woods, among other projects. The result was a beautiful park in the woods that Uihlein kept open to the public. (It has since been subdivided and The Gardens subdivision sits on a portion of the former park.) With the success of this collaboration, Jensen became a popular landscape designer among Chicagoans building estates on Geneva Lake, particularly the German-speaking elite (who appreciated that he was fluent in German). He went on to design the grounds for twenty of the estates being built around the lake between 1901 and the Depression, when estate building came to a halt. 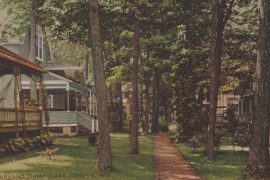 Some of the famous estates that featured his work included Thies and Maria Lefens’ Black Point cottage (east of the main house), Charles Wacker’s Fair Lawn, Harley Clarke’s Clear Sky Lodge, the Grommes estate Allview and the Swift estate Edgewood, among many others. According to Notz, during the early part of Jensen’s career he was usually brought in to design the grounds after a main house was built. But as he gained esteem and as the Prairie School philosophy became better understood by clients, Jensen was often consulted in conjunction with the architect and was engaged to help site the home in the most natural placement on the property. In this way, he worked with some of the leading architects of the day, including Howard Van Doren Shaw and Richard Schmidt (brother of Dr. Otto Schmidt of Black Point) on Geneva Lake estates. 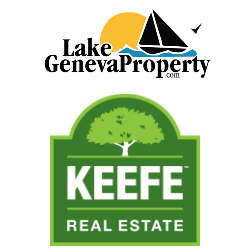 Today, most of the Geneva Lake estates of the past have been subdivided and the land that Jensen designed now contains additional homes rather than vast parkland. Even those historic estates that survive today around the lake have usually undergone a re-landscaping over the past century, so that little if any of Jensen’s work survives today exactly as he envisioned it. 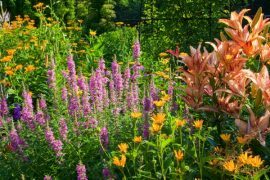 Despite the fact that much of Jensen’s work does not survive in its original state, the effect that he and other Prairie School landscape designers had on the area lives on. Walk around the lake in the fall and you may notice that the colors are especially vibrant and long-lasting. Wherever you see a particularly beautiful tree, remember: it may have been planned specifically to impress you from that angle by the expert hand of Jens Jensen.